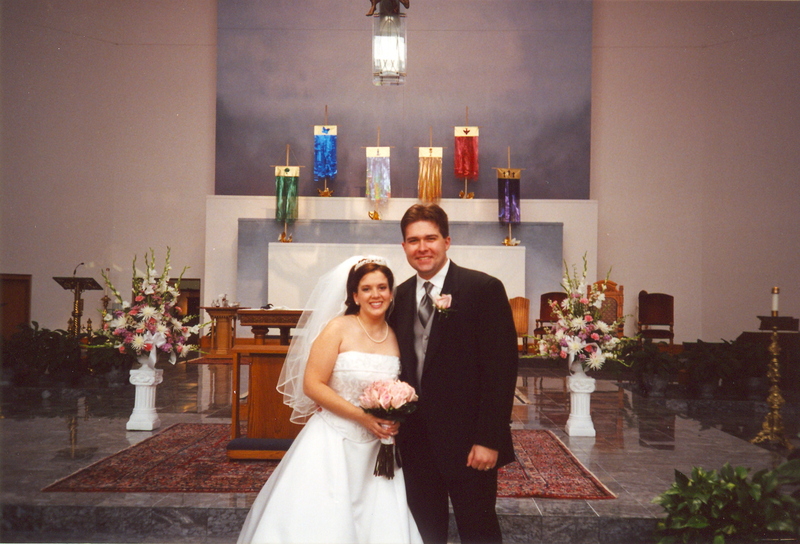 Last week, my hubby and I celebrated our tenth wedding anniversary. Ten years. A whole decade. And we’re still happy and in love. I remember when I was little, we were flying to Florida for a family vacation and at the gate, there was an old man holding flowers, waiting for someone. All of a sudden his eyes lit up, and a little old lady came up to him. They kissed. It was a passionate, “I am so happy to see you, my love” kind of kiss. The type that should be on the cover of Time magazine. They walked to baggage claim holding hands and leaning into each other. And I was shocked. I’d never seen that kind of passion in people older than high-school age (except maybe for my grandparents, but in a much more proper manner). But I remember thinking “I want that someday.” Maybe they were newlyweds, and not the life-long partners that I’ve thought them to be, but still, it’s given me something to shoot for. It strikes me that that’s not always the case. So many people get divorced, and a lot of people who are married aren’t really happy in their relationship. I hate to admit this, but until the past few years, I didn’t think long, happy marriages were possible. It seemed to me that if people stayed together they just kind of settled into a comfortable partnership – a ‘good enough’ scenario. Except for a couple of oddball marriages that I thought were just pure luck, it wasn’t until I began working at a church when I moved up to NC that I started seeing these life-long happy, loving marriages as true possibilities. I began to ask the secrets to a long and happy life together every time I got the chance. Then there’s the school of thought that makes me giggle and say “Damn right!” Like the man we met on the flight back. He is a two-star general in the Army, in charge of some heavy-duty stuff that keeps our country safe and keeps it moving forward. He shared with us a lot of his thoughts on raising a family. He really opened my eyes to being more strategic and goal-oriented with our kids and with ourselves. He and his wife periodically go through a goal-setting process, where they separately write down goals in different areas of life and then come together to discuss their goals, how they fit together as a family unit, and how they can support each other in their personal goals. He said once he figured that out, his life has been much, much better. Talk about a wise man. All jokes aside, I think there’s definitely something to that. I strongly believe in women’s intuition. Traditionally, women may not have been as educated or accomplished as their husbands, but women tend to kind of run things, whether men know it or not, right? We have a sixth sense about things that I’m willing to bet are right nine times out of ten. And it seems to me that the happiest relationships, especially when I look at the older couples where women weren’t as ‘powerful’ as men, it’s those relationships where they treat each other as equals, and where the man really values his wife as an intelligent, critical part of his life where there’s that true spark that stands the test of time. The key seems to be communication, but perhaps more than that. There’s some sort of intangible give-and-take, not just talking and listening, but taking to heart what is being shared. The couples I see that are happy after decades have genuine concern for each other. They wait for each other, open doors for each other, hold hands – even when their hands tremble. When they are apart for more than a few minutes, you can see them looking out of the corner of their eye to see if their partner has come back. You can see there’s true respect, admiration, concern and love for each other. You can see a lifetime of shared experiences, both good and bad that have entwined them into one solid unit, not just people that have shared a house for a few decades. I’m still not sure how much of that is luck and the stars aligning when you meet someone, and how much is hard work and commitment to your relationship. But I have every intention of finding out how to get that happily ever after. What do you think are keys to a good marriage? This entry was posted in celebrations, Lil bit about me, The Happily Ever After and tagged marriage, relationship on June 14, 2012 by aliciamariel.